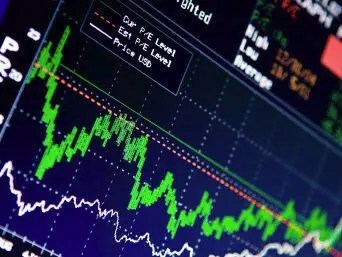 So says Lou Basenese (www.wallstreetdaily.com) in edited excerpts from his most recent 2 articles* entitled Charts: 10 Reasons To Expect A Year-End Stock Rally (Part 1 and Part 2). Higher stock prices and, of course, more jobs. 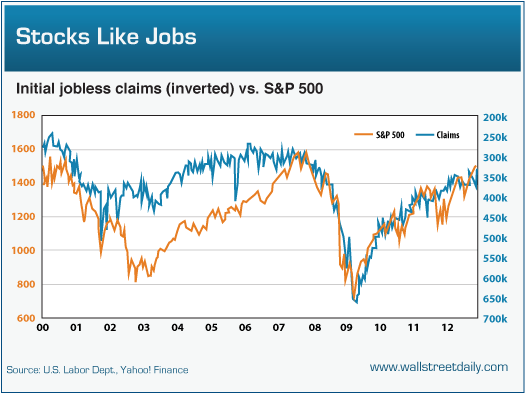 A strong correlation exists between stock prices and the four-week moving average of initial jobless claims. As claims fall, stock prices rise and claims keep falling. The latest jobs reports put the average at 368,000 claims, compared to slightly north of 400,000 a year ago. Over that period, stocks are up 14.3%. Between now and the end of the year, the labor market is expected to continue improving so, as claims keep falling, stocks should keep rallying. #2: On the Brink of Economic Disaster? Hardly! Third quarter GDP growth came in well ahead of expectations at 2%. While that’s below the historical norm, it’s a step in a positive direction and all signs point to even more positive surprises. Retail sales, for instance, increased for the third consecutive month. That’s a trend, not an anomaly and, since the consumer is a major driver of economic activity, an upbeat consumer is good for the stock market. Retail sales aren’t the only bright spot, though. 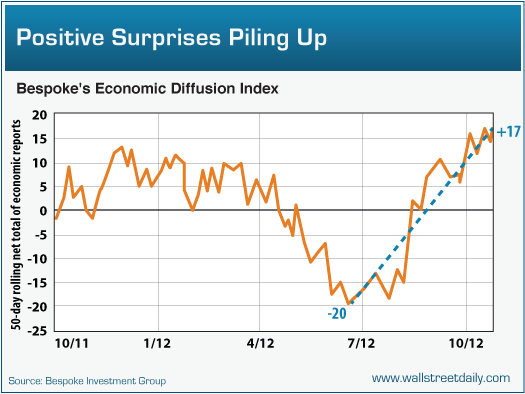 Consider Bespoke Investment Group’s Economic Diffusion Index. It tracks the rolling number of economic data reports that come in better than expected versus worse than expected over the last 50 days and it currently stands at +17. That’s the highest reading since March 2011 – and a sharp reversal from the late summer readings. Individual investors are notoriously terrible market timers. They fall in love with stocks before collapses and swear off stocks before – and during – rallies. Accordingly, we should treat individual investor sentiment as a contrarian indicator and, right now, it’s close to flashing a neon “Buy” signal. 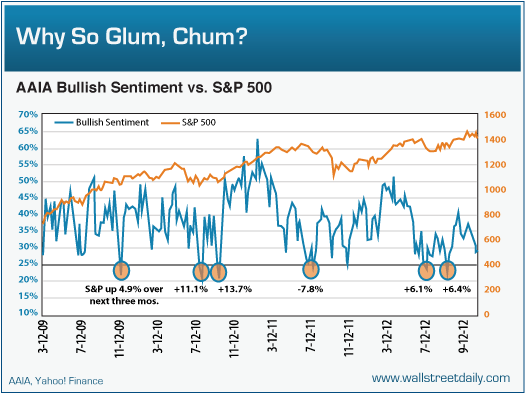 Last week, the American Association of Individual Investors’ (AAII) bullish sentiment reading checked in at 29.22%. That’s well below the long-term average of 38.85% since 1987 and it’s also within spitting distance of the key 25% level. As you can see on the chart, five out of six times that bullish sentiment dropped below 25% during the current bull market, stocks rallied over the next three months – by an average of 5.7%. Therefore, given investors’ increasingly pessimistic outlook, we should be increasingly optimistic. It’s counterintuitive, but it’s true. If you’re one of those people who refuse to put too much stock into sentiment readings, I’ve got news for you: Investors’ latest actions lead to the same bullish conclusion. 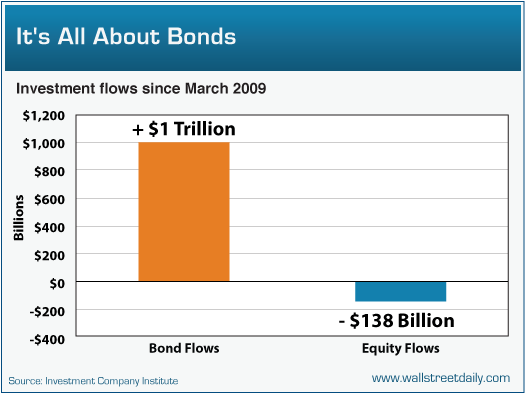 The time to leave a party is when it gets overcrowded…[and] the only party that’s overcrowded is the bond party. investors have yanked a net $138 billion out of mutual funds and ETFs that invest in U.S. stocks…[with] redemptions from U.S. equity funds hitting their highest level in 49 weeks. Conclusion: with investors still piling into bonds and shunning stocks, it’s time for us to cue up some Prince and dance like it’s 1999 because the stock party’s not even close to ending yet. Individuals aren’t the only ones dramatically underweighted to equities….The average hedge fund’s net long exposure checks in at 42%, down from 49% in the second quarter and it continues to hurt their performance. 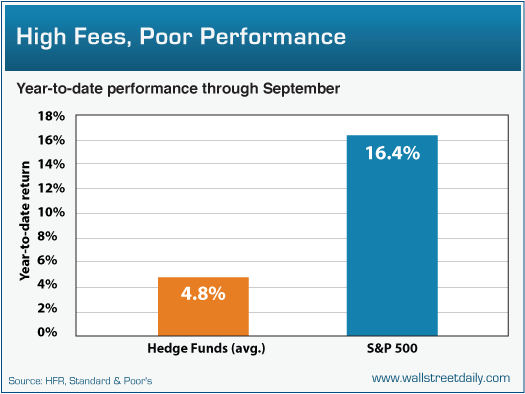 Eventually, hedge funds are going to have to rotate into stocks in a meaningful way just to keep up and, when they do, it should naturally boost prices otherwise investors aren’t going to keep paying high hedge fund fees. If they want to underperform the market year-in and year-out, they can hire mutual fund managers to do it for a lot less. Just saying. Next to April, November’s the best month of the year for stocks over the last 20 years. In November the Dow puts up positive gains 70% of the time – with the average gain checking-in at 2.03%, according to Bespoke Investment Group. The performance over the last 50 years and 100 years isn’t anything to bemoan, either. The market was up 60% and 62% of the time, respectively, for average gains of 0.66% and 1.17%. 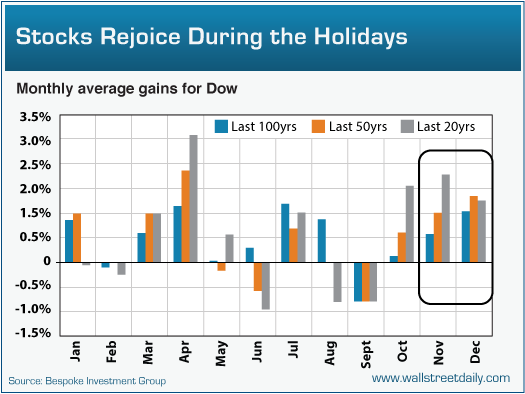 While historical gains in December aren’t as strong, the percentage of time that the Dow rallies is stronger. Over the last 20, 50 and 100 years, stocks rallied in December 70%, 68% and 73% of the time, respectively. Seasonality is not always accurate but is it instructive and relevant. Stocks have a penchant for rallying during presidential election years and so far this year, stocks are sticking to the script…. 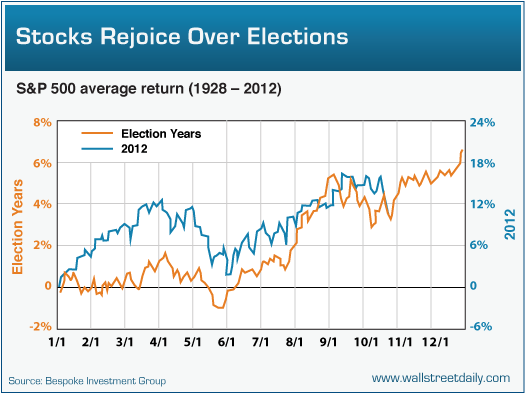 With history as our guide, the rest of the election year should be full of celebration – at least for investors. [With the election over the]…enormous uncertainty weighing on the market [will have] lifted…Such uncertainty has been holding back stocks and businesses. Non-financial companies have been clinging to a stunning $1.7 trillion in cash….but once executives know the leader – and the policies – that are going to be in place during the next presidential term, you can bet they’ll start investing (and hiring) again. Save time: Just read the “Best of the Best” articles! – Don’t delay – sign up here – now! 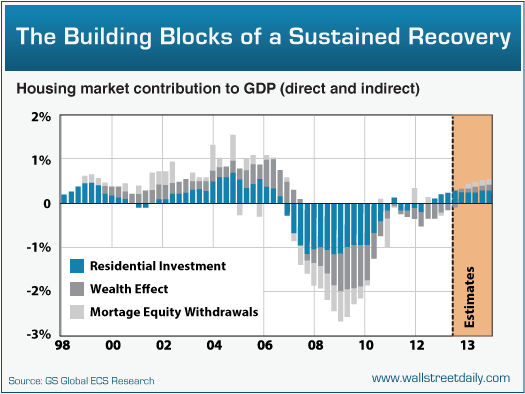 The housing market contributed mightily to the last economic and stock market collapse. Now, it’s starting to contribute to the recovery. Take a look at this chart from the economists over at Goldman Sachs. As you can see, housing’s contribution to GDP is transitioning from a huge hindrance to a huge help to the overall economy. Goldman estimates that direct residential investment growth alone “will accelerate from 10.4% year-on-year in 2012 Q2 to 13%” by the end of 2013. Add in the “wealth effect” from increases in home prices, and we’re talking about a half-point contribution to GDP growth. That might not seem like a lot but it actually translates into a 25% increase to the current GDP growth rate. In my opinion, that’s on the conservative side. Either way, it’s a net positive for the stock market. In terms of relativity, stocks represent an investor’s best choice. 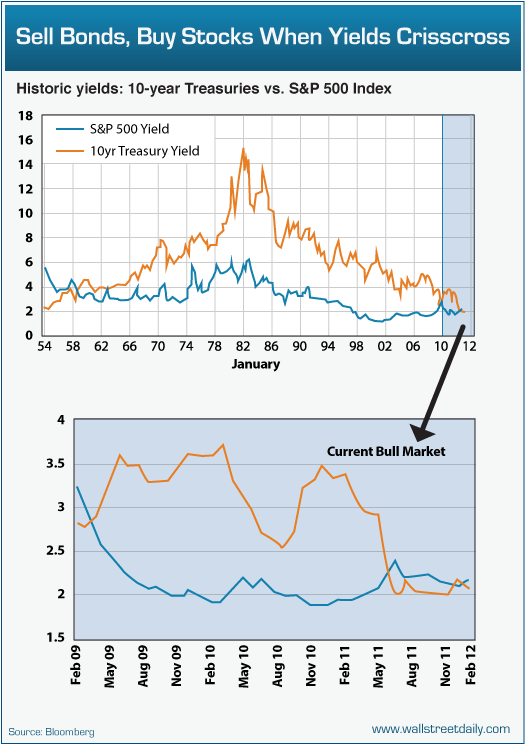 Cash yields nothing and Treasuries don’t either. In fact, Treasury bonds are bid up so high that the S&P 500 Index yields more (2.13% versus 1.72%) and that’s an extremely rare occurrence. Truth is, it’s only happened about 20 times on a quarter-over-quarter basis in the last 60 years and each time, the S&P 500 rose by double digits over the next year. Bottom line: Stocks are the only bargain in town and although the S&P 500 Index has more than doubled in price since the 2009 bottom, stocks remain cheap at just 14.28 times earnings. 1. Don’t Ignore This Fact: “Greedometer Gauge” Signals S&P 500 Drop to the 500s by July-August, 2013! 8. Harry Dent Sees Dow 3,000; Seth Masters Sees Dow 20,000! Who’s Most Likely Right? Next A Must Watch Video On Why America Is In A "Death Spiral"